The family day is designed to publicize an outdoor training program geared to veterans. NEW GLOUCESTER -With a family of six and 3 feet of fresh snow on the ground, Scott Forrey of Cape Elizabeth had it made at the Pineland Farms outdoor center Sunday. Because he is a military veteran, Forrey and his entire family were welcomed for a day of free cross-country skiing, equipment rentals, snowshoeing, sledding, skating, group ski lessons, trolley tours and a go at laser biathlon and archery. “I was in the Marine Corps for 6½ years,” Forrey said. He was taking advantage of Pineland Farms’ Veterans Appreciation Day, which gave veterans and their families free run of the 5,000-acre facility. 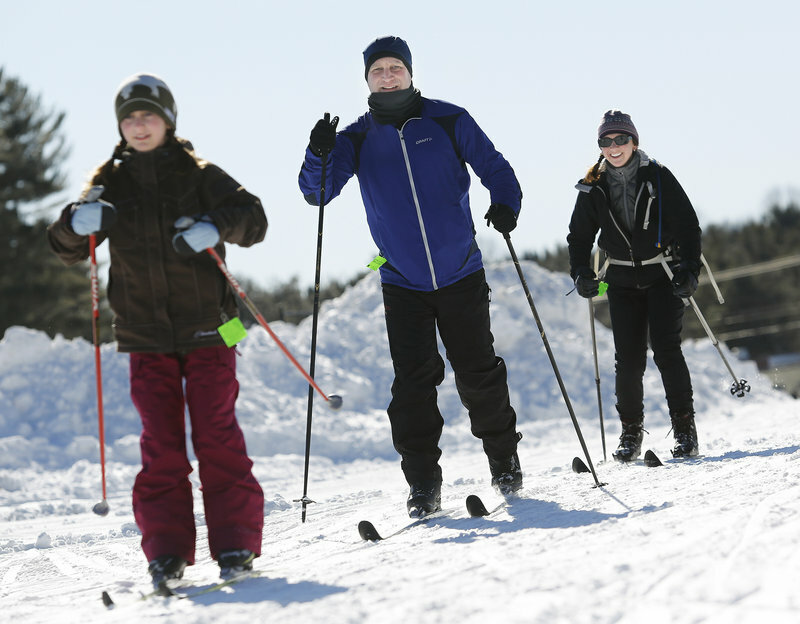 The day was designed to raise awareness of Pineland Farms’ Veterans Adaptive Cross-Country Skiing Program. The program matches military veterans with other veterans who have physical disabilities or post-traumatic stress and other disorders, allowing them to explore outdoor sports together. The day was organized by Matt Sabasteanski, outdoor recreation director at Pineland Farms and a former Marine and National Guard medic in Iraq, and his wife, Kristina, a two-time Olympic biathlete, occupational therapist and Army veteran. The program is paid for by a $25,000 grant from U.S. Paralympics, a division of the U.S. Olympic Committee. The Sabasteanskis said the goal of Sunday’s event was to get more veterans involved in the outdoor training program, both as volunteers and participants. “It may be the stigma attached to post-traumatic stress disorder” that keeps veterans from accessing such programs, said Kristina Sabasteanski. She said there is an instant rapport that develops between military veterans, who have limited opportunities to interact with other veterans because Maine has no military bases. “Veterans helping veterans offers a certain comfort level,” said Matt Sabasteanski. Volunteers receive training and do not have to come every week, said Kristina Sabasteanski. Norm Bracy of Buxton, a Marine Corps veteran of the Vietnam War, said he decided to bring his granddaughter Natalie Sok, also of Buxton, when he heard about Veterans Appreciation Day. He said the veterans outdoor training program makes sense. “It is a good idea and it gets you outdoors,” Bracy said.